Featuring Unique One of a kind knit clothes, knit scarves and knit baby items are hand loomed especially for you with hand painted designs! Sharon Nani, owner of The Knit Tree, loves to design that special knit garment to teach a fabrication, or knitting skill, play with new yarns, colors, or just have fun knitting! After the knit pattern is published, or the class is taught, you may find the knit sample or prototype offered to you in this showroom. Sharon's Little Knitters have grown up and taken the knitting techniques from their knitting lessons unto new creative adventures. The One of a Kind showroom features the hand painted knits of Crochet Critter who is now a stay at home mom with two young daughters who are non verbal and autistic. 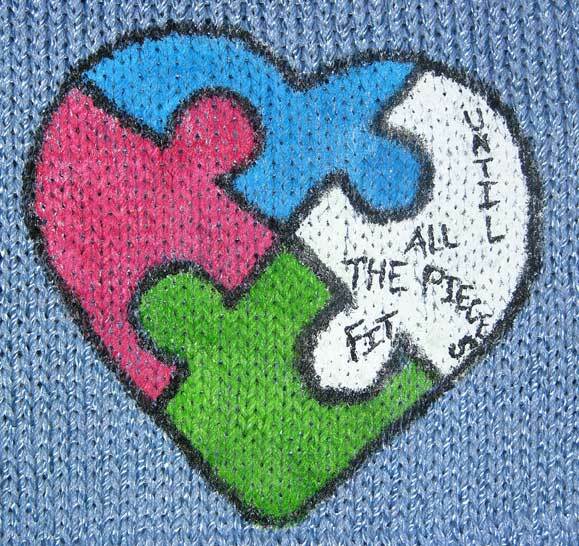 See her hand painted autism heart puzzle on knit caps, knit scarves, knit baby clothes and more. Read more about Danielle, the Crochet Critter and her home cottage business. 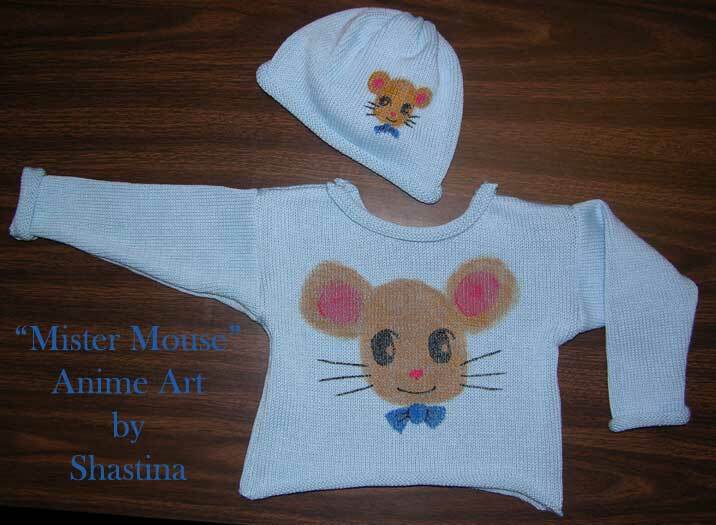 Another Little Knitter, Shastina, is featured with her delightful Anime Knits hand painted on knit baby clothes and more. Read more about how Daniel and Shastina paint on these knits. We offer knit and hand painted scarves, caps, baby and toddler clothes in various colors and fibers such as rayon chenille, shine rayon, cotton, rayon and cotton blends, We have bamboo and wool rayon on our test fiber for hand painting list. Experimenting with knitting and hand painting is such fun. The recipient of these knit items can smile as they wear the creation or give it as that special one of a kind unique gift. 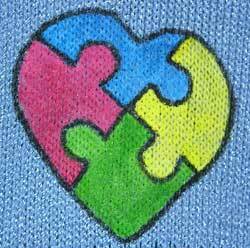 You can even support Autism Awareness by buying on of the hand painted autism heart puzzle knits because 10% of all sales on these items are donated to A Touch of Understanding. Come back often to find these one of a kind items because they go fast and you may find the one of a kind specialty knit category may be empty. Autism Awareness heart puzzle with missing piece knit on a scarf. The heart with the missing white puzzle piece and the scrambled words "Each Piece is Unique" represents the differences in how the autistic child / person processes the world around them. Some are non verbal and have the frustrations of communicating, Some have sensory issues which may include feeding problems. Some are just seen as eccentric. Each is unique in their own way. Go to our online store in the special hand painted autism knits category to purchase this Autism Awareness knit heart puzzle scarf and support Autism Awareness. If this scarf is already gone, check back, more will be on the way! 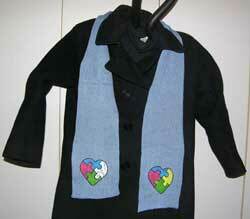 Knit Rayon Chenille Scarf featuring hand painted Autism Heart Puzzle. 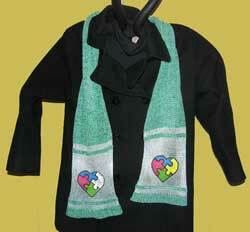 Knit Rayon Chenille Scarf in Jade green featuring hand painted Autism Heart Puzzle on the shiny rayon jade green stripe. Go to our online store in the One of A Kind Unique Scarves category to purchase this Autism Awareness scarf and to examine more scarves as they are painted. The hand painting is done on a smooth natural fiber such as cotton, rayon, or their blends. The fiber in the rest of the scarf can be uniquely different such as the textural, soft, and luxurious rayon chenille. Cotton and shiny rayon caps are a favorite unique knit and hand painted item. 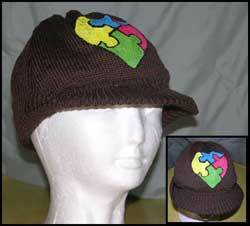 The Cotton knit Visor Cap with hand painted Autism Heart Puzzle is a popular item. Go to The Knit Tree Online Store to Purchase this Knit Visor Cap. If you prefer a skull cap, we have that style also. 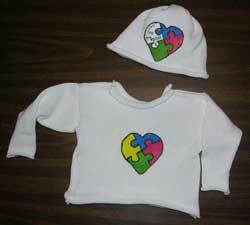 Cotton knit Baby sweater and cap shown here in size 2T with hand painted Autism Heart Puzzle Go to The Knit Tree Online Store to Purchase the baby set in colors white, pink or blue and sizes newborn thru 4T. Crochet Critter will take special orders to hand paint the knitted products with the autism heart puzzle and a name if you have a special person you wish to honor. Contact Us with your request if you do not see the item already available in our online catalog hand painted autism knits category. Items are put in the catalog as they are knit and painted. 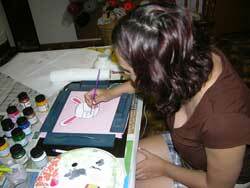 Shastina paints one of her anime art characters on the cotton fabric. Shastina started drawing Anime Art at age 6: Anime means Japanese Cartoons. Then she started knitting on the Little Knitters Program when she was in 6th grade. 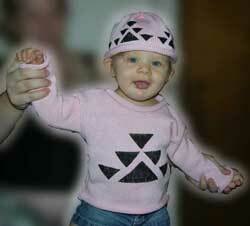 Read how she painted these great whimsical anime characters on her One of a Kind cotton knit sweaters. Then go to The Knit Trees online catalog to purchase one of these unique creations. Cotton is not only a great fiber to paint on read Why Cotton for Babies to see why Cotton Knits are great for babies too! . 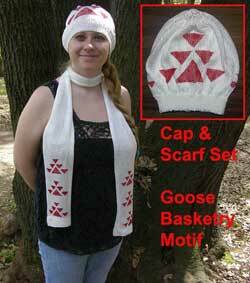 Indian Goose design hand painted on the shiny rayon knit cap and knit scarf. Native Design & Art enjoys painting on the natural fibers too. The cotton baby clothes with hand painted Indian designs are a special way to honor the little one wearing the knit baby cap and sweater. These are special order items. The shiny rayon yarn is a very elegant and drapey fiber. It is too large of a fiber to use the jacquard knitting technique to knit in Native American design. Therefore, hand painting on the shiny rayon yarn is an excellent choice of offering Native knit scarves and caps with the different Indian basketry designs. 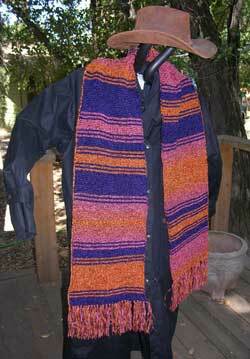 Go to The Knit Tree's Hand Painted Native Knits category of the online catalog to see what is available. come back often to see what has been painted because these are offered as One of a Kind Knits as they are available..
Caption for image on the right side. We've gotten requests to knit this special scarf in different lengths -and we love to please our customers. 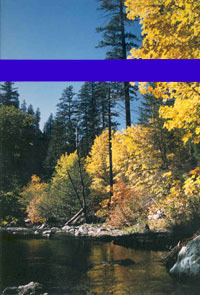 The photo is of the original 15 foot size or full size. The Dr Who Style Scarf Season 12 can be purchased or special ordered in 5 foot: ($55), 6 foot: ($65), 7.5 foot:($75) and 15 foot: ($140) We try to keep a full and half size in inventory, but sometimes there is a wailing list. The photo on the right is A Replica of the Season 18 Dr Who Style Scarf worn by Tom Baker in the British TV Series. This 8 foot scarf is at one half the size of the original scarf because chenille yarn is much heavier in weight then the wool Season 12 knit scarf, although we have knit them full size by special order. The half size Season 18 replica Dr Who scarf in photo is available in our online store. Read the full product descriptions of both of these hand knit scarves in our online catalog store. Click Here is see the article and follow all the links under Instructions to see the Basic Knitting Techniques and all the CLOSE UP PHOTOS OF THE SEASON 12 SCARF ~ Read the whole article to follow the whole knitting experience of The Little Knitters and encourage Little Knitters of your own! We also offer the Dr Who Style Season 12 yarn kit and pattern those who would like to knit their own Dr Who Style Scarf. "Carrots and Peas" - An Experimentation in Fibers and Textures! A glass of wine and a comfy Grape Cardi Relax and Enjoy! 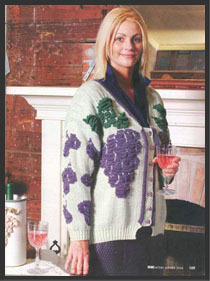 Plumpious Grapes Blister cardigan designed by sharon Nani for the Knitters magazine. 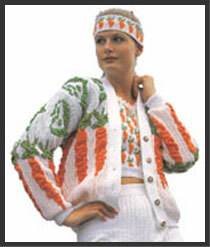 Sharon Nani's design: "Carrots & Peas" was first published in a Swiss Knitting Model Book in 1994. The unique Tri-dimensional "blister" fabric became one of her design trademarks. Mixing several different fibers within a garment tells the story behind the motifs. Mercerized Cotton feels smooth like the peeling of the carrots or the shell of the peas. Rayon Boucle is bumpy and rough like the leaves of a carrot. It is all brought together with the glamour of the shine in the main background yarn. Together they all remind you of what your mother always told you: "Eat your Carrots and Peas"
Both of these sweaters have been sold, so watch the of a Kind category of The Knit Tree's online store catalog to see if other creations become available for sale. The Knit Tree will be offering these Articles written by Sharon Nani in a special category as time allows to convert them into Web language. So if you want, tackle knitting this Knit Cardigan yourself on a Passap Electronic knitting machine or translate to any electronic standard gauge machine. The original Cardi is no longer available in our Online Catalog in the One of a Kind Tops, but watch for other Wearable Art or Unique Knit garments.